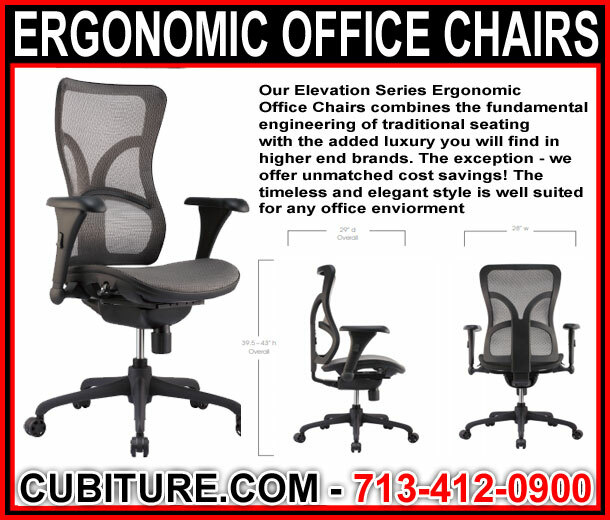 Ergonomic Office Chairs – Complimentary Quote 713-412-0900 – FREE Shipping! It can be safe to say that, by far, one of the most important features of today’s office workstation is the ergonomic office chair. A study of has shown that 86% of American full-time workers are seated for 12 hours a day. At least eight hours a day of this is devoted to desk-based work, with usually no more than 30 minutes or an hour dedicated to a break in the workday. By this point, we’re pretty well aware of the effect that one’s physical health has on their ability to be a productive and content worker. The way that someone sits makes a major contribution to their health, especially if doing so for hours on end and without the help of an ergonomic office chair. Hours of incorrect posture in a normal chair can lead to a number of spinal discomfort issues, experienced as neck pain, lower back pain, and even headaches and jaw pain. Often you may find yourself needing to stand up or stretch in order to relieve the stresses that are placed on your muscles throughout a day of incorrect posture. There are several important features to look for in an ergonomic office chair. Ergonomic chairs are generally designed with maximum adjust-ability in order to adapt to each individual’s unique level of comfort. This mainly includes an adjustable headrest, supportive cushions along the chair’s back, adjustable armrests, adjustable seat height, and ease of movement via chair wheels. Another important consideration in an ergonomic office chair is to find what’s called an eight-hour office chair. In other words, this chair is designed so that you can sit in it for eight hours without feeling any of the discomfort or pain that would come with any other, cheaper office chair. In fact, many office chairs such as those sold by big box stores, aren’t suited to sit in for more than four hours. Given how often the average employee sits at their workstation per day, an eight-hour ergonomic office chair would definitely be worth it. All these specific features that can be found in our superior line of comfortable and stylish Viper ergonomic office chairs, designed with every aspect of your comfort and well-being in mind. Cubiture office chairs have a synchronized seat and back with tension adjustment along with a multi-position back lock. The back is a black mesh with integrated adjustable lumbar support. The adjustable armrests can be lowered to the height of the seat and even be completely removed. If you’d rather come to experience maximum comfort for yourself, come into our Cubiture showroom to test one of plenty of our ergonomic office chairs for your personal workstation. Our chairs are competitively priced and are guaranteed to be rated to 8 hours. Complimentary Quote 713-412-0900 – FREE Shipping!